KEY HOLDERS There are 17 products. 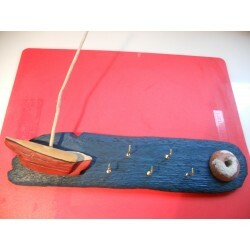 Key holder made from sea plank, hand-painted with water colours and decorated with a red sailing boat with a sail. Alternatively it can be used as a hanger for jewellery, scarves or belts. 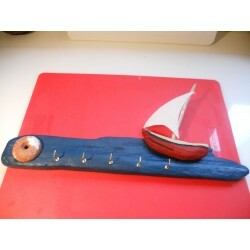 Key holder made from sea plank, hand-painted with water colours and decorated with a red sailing boat. Alternatively it can be used as a hanger for jewellery, scarves or belts. Key holder – key ring with nautical knots –Large. 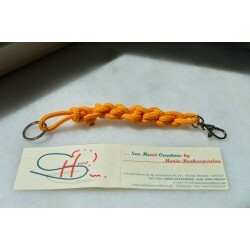 Every key ring is made of 2m long 3mm string (cotton & polyester). It is available in a 2 colours combination: dark blue and beige. Using the nautical way to gather sailing ropes we end up with 25cm in length. Three other nautical knots were used are Clove Hitch, Anchor Hitch & Figure 8 knot. Key holder – key ring with nautical knots – medium-BLUE. 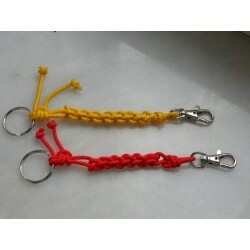 Every key ring is made of 1m long 3mm string (cotton&polyester). It is available in 2 colours: dark blue and red. Using the nautical way to gather sailing ropes we end up with 18cm in length. Two other nautical knots were used are Clove Hitch & Anchor Hitch. Key holder – key ring with nautical knots –Medium thick-Yellow. Every key ring is made of 1m long 5mm waterproof string. It is available in different colours upon order. Using the nautical way to gather sailing ropes we end up with 20cm in length. Key holder – key ring with nautical knots – Small-Yellow. Every key ring is made of 1m long 2mm string (waterproof: naylon &polyester). It is available in 2 colours: bright yellow and red. Using the nautical way to gather sailing ropes we end up with 15 cm in length. Two other nautical knots were used are Clove Hitch & Anchor Hitch. 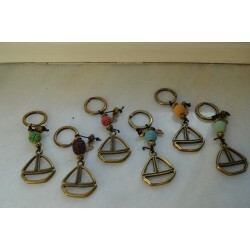 Key holder – key ring with a brass boat, decorated with lava rocks in different colours. 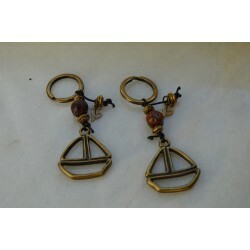 Key holder – key ring with a brass boat, decorated with frankincense. Key holder – key ring with nautical knots – medium-Red. 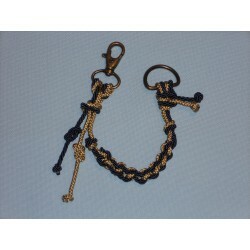 Every key ring is made of 1m long 3mm string (cotton&polyester). It is available in 2 colours: dark blue and red. Using the nautical way to gather sailing ropes we end up with 18cm in length. Two other nautical knots were used are Clove Hitch & Anchor Hitch. Key holder – key ring with nautical knots – Small-red. Every key ring is made of 1m long 2mm string (waterproof: naylon &polyester). It is available in 2 colours: bright yellow and red. Using the nautical way to gather sailing ropes we end up with 15 cm in length. Two other nautical knots were used are Clove Hitch & Anchor Hitch. Key holder – key ring with nautical knots –Large. 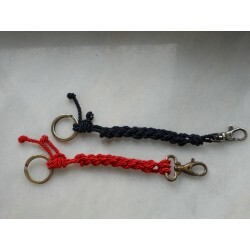 Every key ring is made of 2m long 3mm waterproof string, in a 2 colours combination: red & brown. Using the nautical way to gather sailing ropes we end up with 25cm in length. Key holder – key ring with nautical knots –Large. 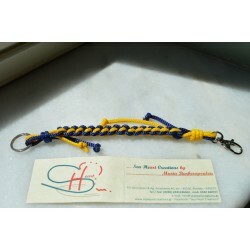 Every key ring is made of 2m long 3mm waterproof string, in a 2 colours combination: blue & yellow. Using the nautical way to gather sailing ropes we end up with 25cm in length.